Freezer friendly tomato soup is a healthy soup recipe that you will want to make a big pot of, because it’s freezable! You can enjoy this easy tomato soup any time of the year. I am excited to feature this wonderful freezer friendly soup recipe today from the very talented Cristina over at An Organic Wife. Cristina was inspired to change her family’s diet after watching the documentry Food, Inc.
Cristina cooks everything from scratch using real, whole food and local, sustainable ingredients. She enjoys canning, gardening, fermenting and culturing foods, and generally experimenting in the kitchen. She also loves spending time with her husband, dog, and bunny. Please visit her page and browse all of the wonderful ideas and healthy meals that she has to share! My favorite soup recipe has always been tomato soup. I have yet to find a brand of pre-made tomato soup that does not have some kind of sweetener added and/or comes in a can lined with BPA (tip: those Tetra Paks aren’t any better). That’s okay, because the abundance of beautiful vegetables at the farmers’ market means that I can make my own. Here’s how you can, too! Not surprisingly, this is the best tomato soup I’ve ever had. That always seems to happen when something is made from scratch using fresh, locally-grown ingredients! Serve it with a healthy salad or a delicious clean eating sandwich, like Aimee’s grown up PB & J.
I hope you enjoy the freezer friendly tomato soup recipe. First, remove the skins from the tomatoes. To do this, bring a large pot of water to a boil. Drop in a few tomatoes at a time and leave them for 45 seconds to 1 minute. Immediately remove the tomatoes to another pot full of cold water (I just use one side of my sink). Score the tomatoes with a knife and the skin should peel right off. When all the tomatoes are peeled, set them aside. To a large pot, add some fat (I used butter). Dice two onions and the shallot and throw them in the pot. You can actually use three onions here, I just had a shallot that needed using up. When the onions and shallot are about halfway to their translucent stage, throw in a large chopped zucchini. Next, add in chopped bell peppers and carmen peppers. Carmen peppers are sweet peppers, so if you can't find them, just use extra bell peppers. Roughly chop the tomatoes, removing the stem and bad spots. Throw them into the pot along with four cloves of garlic. Pour in three cups of chicken stock. Of course you can use vegetable stock if you want to keep it vegetarian. Stock adds a wonderful depth of flavor. Let it all cook for ten minutes, and then use an immersion blender to puree it into soup. Turn the stove down, add the dried basil, and let the soup simmer for another 30 minutes. Because of the low acid content, this soup cannot be water bath canned. When the soup is done, set it aside to cool before transferring it. Use a ladle and carefully pour the soup into glass jars. Be sure to leave a little room for the liquid to expand in the freezer. 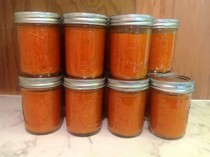 Tighten the lids on the jars and set them upright in the freezer. This recipe makes 23 half-pints, which are the perfect serving size. Whenever you want soup for lunch, just take one out to defrost in the morning.